Yesterday morning (very bright & early I might tell you!) 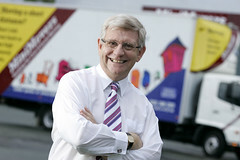 I went to see Mike O’Hagan of MiniMovers speak. He was fantastic – here’s a man who started a business that has turnover in the vicinity of $30 million with $200 and a ute! He said that he was looking to create an opportunity whereby he could fill a market gap, earn a stash of money but it not be reliant on him. Mmmmm…. And Mike was kind enough to share his ‘secrets’ for success. This is a fantastic message for anyone who has started a small business and you’ve found that it’s taking over your life! Look for ways of systematising the business so that you can duplicate the processes and start making serious money – all while freeing up your time. Simply glorious Mike – thanx.